Constantly checking and fiddling with your phone can wreck your workout. Have a look at our top tips on why you should consider taking a break from your emails and Instagram feed when exercising. You can’t get the most from your work out and get into the ‘zone’ if you allow your phone to distract and interrupt you. Just as you can’t concentrate on completing a piece of work or reading a book if your phone is constantly pinging, vibrating and flashing from notifications. If you find the idea of being parted from your phone really tough why don’t you ‘reward’ yourself with a smartphone fix at the end of a tough workout – you can lose yourself in your Instagram feed (or email, or snapchat, or game) guilt free knowing that you have earned the indulgence. Exercises like Yoga and Thai Chi which are centred on mental focus as well as physical control and strength are great for cognitive development, managing stress and mental health. You can apply this focus to any exercise that you do, be that lifting weights in the gym or running in the park. Remove all digital distractions, concentrate on your breath and tune into your movements and you can give your mind a healthy work out at the same time as your body. If you leave your phone on, interact with it or let it distract you whilst exercising you are more likely injure yourself. 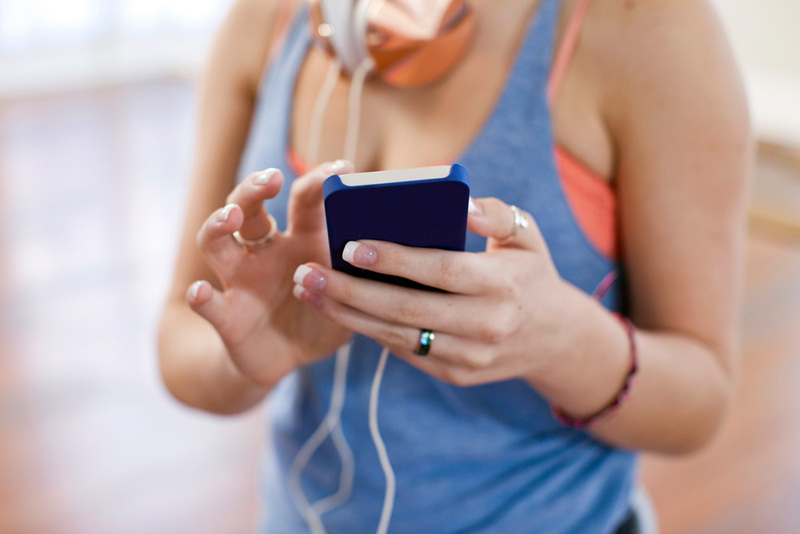 Actually using your phone to change songs, text, browse or call will effect your balance and stability meaning the likelihood of an embarrassing fall from the treadmill, never mind distracted joggers running into traffic. Beware fitness apps, whilst they can be useful to motivate and track your training they can also be addictive and disassociate you from what your body is telling you. I became so fixated on the data from running apps, concerned about my mileage, speed, performance that I failed to listen to my body and ran into injury. I now run naked! Not NAKED, naked but without a watch, a phone or a running app. I feel much more in tune with my body, my performance has improved and I am coming back from runs refreshed and rejuvenated. You can read more here about my marathon training without technology here. If you really can’t be parted with your phone, or feel it offers security when you are running outside for example, at least have it zipped away. Turn it off, switch it to flight mode or try using apps that will disable the use of the functions on your phone (some that we love are here). OFFTIME for example is an app that lets you choose what functions you need to use within a defined period of time and disable the rest. So you could still listen to Spotify for example during your workout. Just remember to prepare your playlist in advance and keep your phone zipped in a pocket so you aren’t tempted to let it distract you. No one looks at their best red faced and sweaty. Remember that fitness is not just about looking good – feel the strength in your own body and focus on what it can do, rather than how you look and you’ll get a lot more out of your work out. If you find it agonising to be parted with your phone for even a short workout it may mean that you have developed a behavioural addiction. So what does this mean? Dopamine floods the brain when you engage in social media, gaming, online shopping or whatever your particular smartphone vice is. Professor Greenfield who is the founder of a technology addiction clinic has said we are all carrying around ‘portable dopamine pumps’. If you are addicted, abstinence is hard so you need to think of healthier ways to get your dopamine fix. What better way of naturally boosting your dopamine levels than through exercise? Be brave and go for a tough work out without the tech, keep the phone off whilst you shower and get dressed, let your mind run free. You may just find a more fulfilling natural high than the one you are seeking when you obsessively swipe and tap a screen.